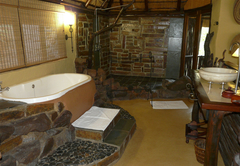 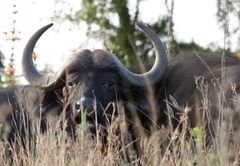 Duma Manzi Eco Lodge & Spa is a highly recommended KwaZulu Natal game lodge providing a wildlife experience for discerning tourists visiting Natal Midlands. 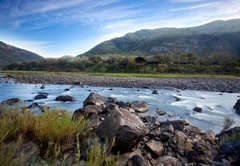 Duma Manzi is a Wildlife Retreat, a sanctuary offering unique African Wilderness. 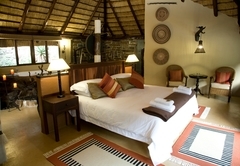 A small, luxurious Boutique Eco-Lodge, providing the most affordable 5-Star experience with an elegant and personal touch. 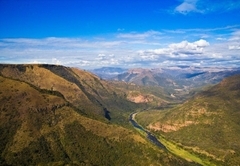 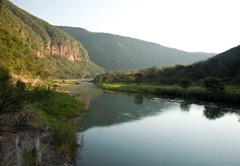 A comfortable one hour drive from Durban and 45 minutes from Pietermaritzburg, lying on both sides of the Mkomazi River, lies a 5000 hectare malaria and predator free reserve, nestled in the forest valley. 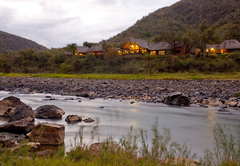 This extraordinarily beautiful and tranquil African Wilderness setting is the ideal retreat for those seeking privacy, exclusivity and absolute serenity. 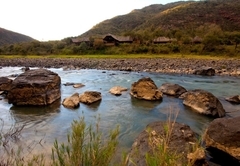 The Main Lodge is the perfect place to have your sundowners, overlooking the river, relax with your book on one of the comfy couches, or mingle with fellow guests. 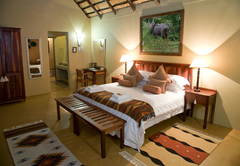 Blending seamlessly into nature, all our luxury rooms are perfectly situated in secluded privacy to complement the inspirational location. 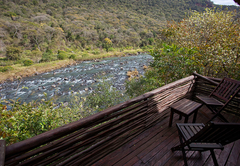 Each luxury room has its own private deck overlooking the river, with mountain views. 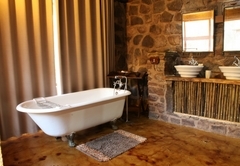 The five exclusive Sandstone Luxury Rooms, each with their own private plunge pool, allow guests intimate tranquillity within the secluded luxury room, providing romantic African charm. 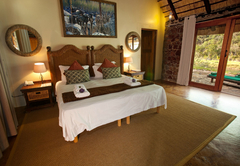 Glass doors from the bedroom and bathroom, lead onto a wooden deck overlooking spectacular view of the river flowing past. 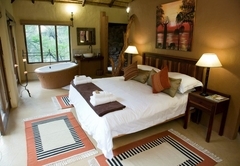 Fish Eagle consists of four open plan luxurious rooms, allowing total seclusion in relaxed intimate surroundings. 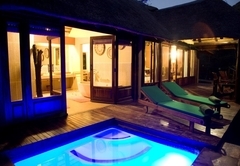 The luxury rooms have their own communal pool to relax and take in the exquisite surroundings. 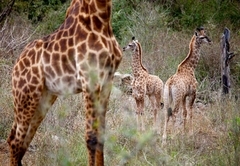 The Luxury Family Unit allows a quality bonding experience, for those who want to have their family together. 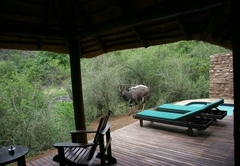 The unit has its own private garden and rock pool. 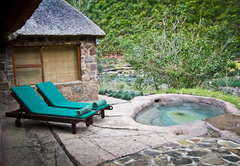 (Please note that the Rock Pool is not netted). 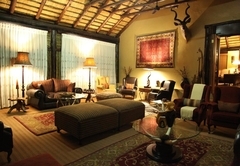 Duma Manzi is the home of sophisticated African Fusion Cuisine offering healthy and home style traditional foods. 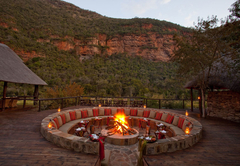 We pride ourselves on the fact that all our ingredients used are fresh and local and our dishes are made in traditional South African and African styles. 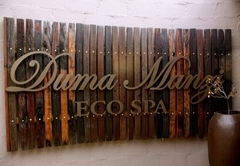 Duma Manzi Eco Spa follows a holistic approach to health, combining all aspects of physical, mental and spiritual wellbeing to rejuvenate mind, body and soul. 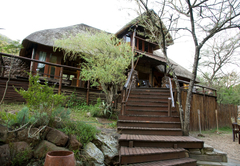 Duma Manzi is the perfect place where the noise of our busy lives is drowned out by whispers of tranquillity, a place where we can draw upon the strength of a healthy body and the sanctuary of our inner calm. 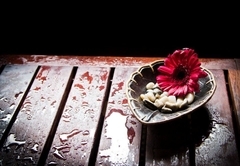 Accommodating only eight guests per day, our Eco Spa ensures an individual experience of sheer indulgence. 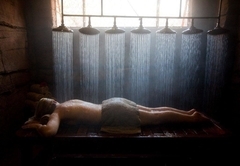 Duma Manzi Eco Spa boasts a wide variety of unique wellness treatments to restore what life’s stresses deplete. 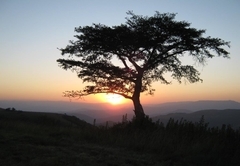 We have chosen Dr. Hauschka as our premier Spa brand and in addition a small range of unique natural and organic products are provided by Instinctive by Nature. 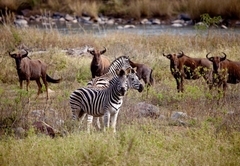 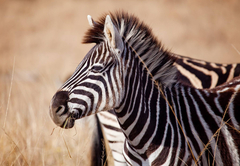 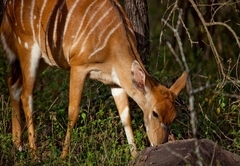 Two scenic game drives: one on arrival as transfer to our Boutique Eco Lodge & Spa (+/- 40 minutes) the second scenic drive is on your day of departure, from the Lodge to Hilltop reception.